Play on maps designed by Stardock. They introduce new challenges, dangerous threats and worlds to explore. In addition to a new hand crafted map for every map size along with new stamps to spice up random map generation, it also includes the full Anthys map. A gigantic map that contains the entire known world of Elemental (at least, as of ~150 AC). Clash- Play against a single opponent on a balanced map, or discover a ship and explore the nearby islands. Crucible- Four opponents with a common area between their starting positions, can you hold the center and take out your enemies? Dust Bowl- A dangerous map with few fertile positions. But the land isn't empty, hordes of monsters have claimed it. The Wildlands- 10 Wildlands on one map. Can any empire rise in a world ruled by monsters? 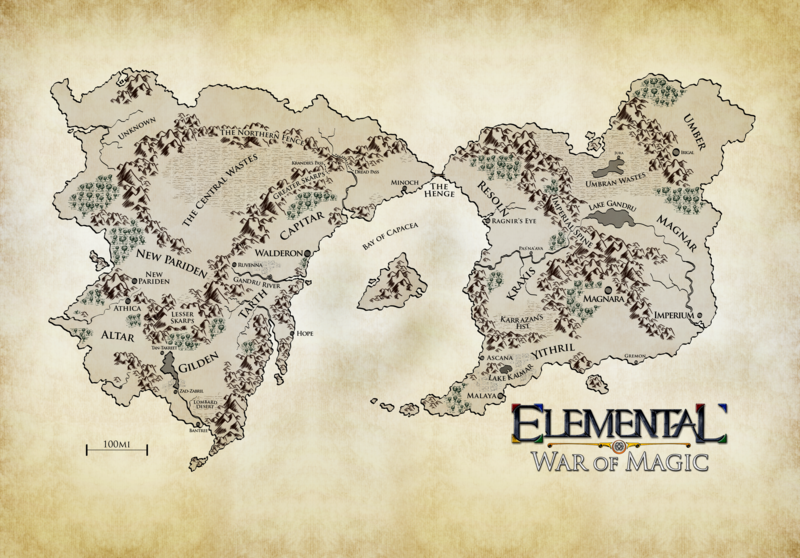 Anthys- Play across the entire world of Elemental on this map that is over twice as large as the largest maps in Fallen Enchantress. Price of the DLC is $4.99, and purchasing options are available on the DLC info page. Bought like a boss, can I get my pics of Ceresa and Procipiniee in corsets now? Bought it (although I don't care about pre-designed maps!) but it does not show up in Stardock Central. Downloading from the store and installing manually worked of course. hooray stamps! would've liked more creatures and monsters in the DLC, but I'll take stamps. and besides, you guys gave me FE for free! There's a bug with purchasing from the website link for those who got free copies- says I didn't purchase the game. I didn't purchase the game, but is the DLC free for those who got a free copy of the game? Logging in again worked, but there is a bug in the system. Can anyone confirm if the Anthys map has randomly placed factions, monster lairs, heroes, and resources. Or is everything locked in? Those descriptions should show up on the map selection screen and it would also be nice to see the map's origin (base game, map pack one, Modder Joe Banana, ...). Cant wait to try the Wildlands one for the mayhem. We're sorry, but it appears that you didn't purchase or receive Fallen Enchantress from Stardock. I had the same issue at the start, i just logged out of Stardock Central and signed back in, clicked the link again in the OP and mine went through, you purchase it then it shows under 'My Downloads' and hey presto. This is what I get. I bought the game a couple months ago. I owned the original but didn't ask for a free copy. Any suggestions? OK I got it! Ha ha just installed new vid card yesterday! I got the same error but instead of reading the forums for the solution bought a copy from gamersgate (not realizing it was a steam game) so now I have 2 copies. So the 1st person who pm's me and has the steam version can have the steam activation code for the dlc. Looks like I'll be picking this one up as soon as 1.1 is out. Bought it. Also ran into the bug where I tried to purchase using the link. It then said I didn't own the game. I had to relog back into stardock's website and buy manually. What new stamps have people seen, either in situ or with the editor? ... didn't really have time to test it out yet in real detail though. Does the Anthys map contain all stamps and all Wildlands? Does the DLC add ships to random maps? Nice, got it! Excellent timing as it is 'Sinterklaas' here in Holland today. The Antherys map sure is huge... I'm 6 hours into a game and I haven't even explored the right continent yet. Playing Stormworld, I have THREE wildland bosses around my territory roaming around. Unfortunately I specialized in Fire, and my first champion was also a Fire mage, so I am having lots of difficulties with Delin, the Pyre of Man, and his cohorts. 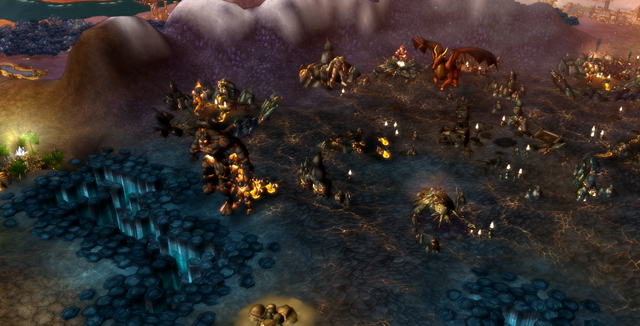 I sure would like that 3x Fire shard in his territory though... Greenskin occupy the swamps to the south, and Frost Giants have the icy and rocky lands to the north. PS. I recommend you play the maps without looking at them in the editor. There's lots of thematic stuff going on that is kind of hard to enjoy if you just look at the map. is there a "recommended" number of civs for the Anthys map? the default 6 for large maps is obviously not enough. I guess 10/12 would be better. I put 11 opponents in my current game. Two hours in and I haven't met any yet. I played with 12 although it got damn slow between turns. 1) Are the new random map stamp bit that compelling? 2) Do these scripted maps still have any sort of randomization? If so what aspects can be/are randomized?